PIZZA TEEN! : Selections From "The Copulatin' Blues Compact Disk"
Selections From "The Copulatin' Blues Compact Disk"
From Alan Greenberg's editorial review on Amazon.com: "For the last century and more, the only place in a black American's world safe from the bossman's grasp has been the bedroom. A sense of this freedom in all its audacious raunch and hilarity fairly leaps from this brilliant anthology of bawdy blues recordings from the late 1920s through the 1930s. 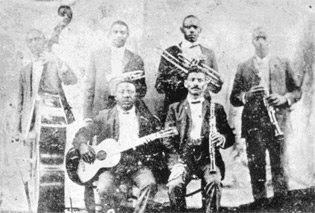 There are many raw delights to savor, such as Sidney Bechet's thrilling clarinet on "Preachin' Blues"; Tampa Red's Hokum Jazz Band with horny little Frankie Jaxon vamping his lead vocals on "My Daddy Rocks Me with One Steady Roll"; "Don't You Make Me High" by Merline Johnson, the Yas-Yas Girl; and "Get Off with Me" by Coot Grant and Kid Wesley Wilson. The most outrageous gem in the trove is "Winin' Boy" by Jelly Roll Morton, who, in black tie and tails, performed this vulgar masterpiece before unsuspecting governmental dignitaries in the Library of Congress just before World War II." That last track is very... um.... specific. She's a gal who knows what she wants. so THIS is where rap comes from!